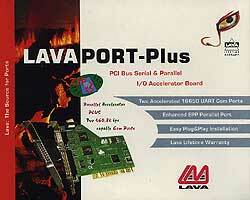 The LavaPort-Plus board from Lava Computer Manufacturing is a powerful add-on PCI card that adds two ultra high speed 16650 Serial (COM) port and one enhanced (EPP) parallel port. One COM part has a 9 pin interface and the other has a 25 pin interface and both support data throughput of over 400 Kbps. The parallel port can be up to 3 times faster than ISA parallel ports. 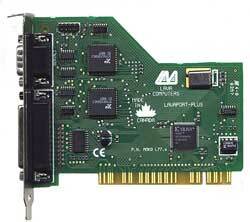 The card is an easy Plug & Play installation and is fully PCI 2.1 compliant. Drivers are included for Windows 3.1/Windows 3.11, Windows 95, Windows 98 and Windows NT 4.0 are included. 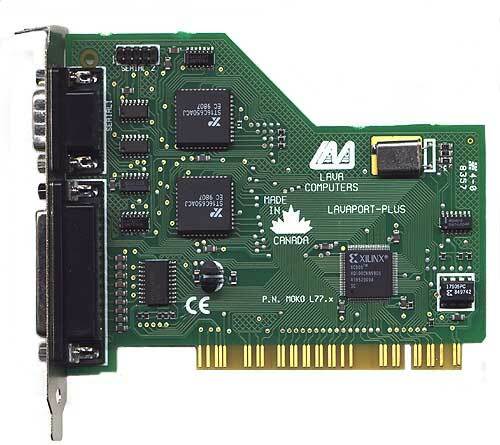 Quite simply, the LavaPort Plus is a serial and parallel accelerator card that was designed to eliminate data overrun errors when attached to a modem and to achieve faster data transfer rates when connected to parallel devices like parallel Zip drives and scanners.